I totally hadn't planned to post today. My ability level has taken a big nose dive & I'm struggling to get used to the new status quo, but there are some things that take precedent & this is one of those things. I saw this on twitter & I just lost it. I really did, I went mental. Everything about this tweet is degrading from the word hot, to the word 'nothing' all the way through to the sentiment. If I was writing an essay I would tear this apart, it is such a loaded tweet! I think the only thing that could have made this worse is if they had used the phrase 'wheelchair bound'. And I am aware that this is supposed to be a joke but it is so much the attitude that society has towards wheelchair users that there is no way that this could ever be funny, you know? 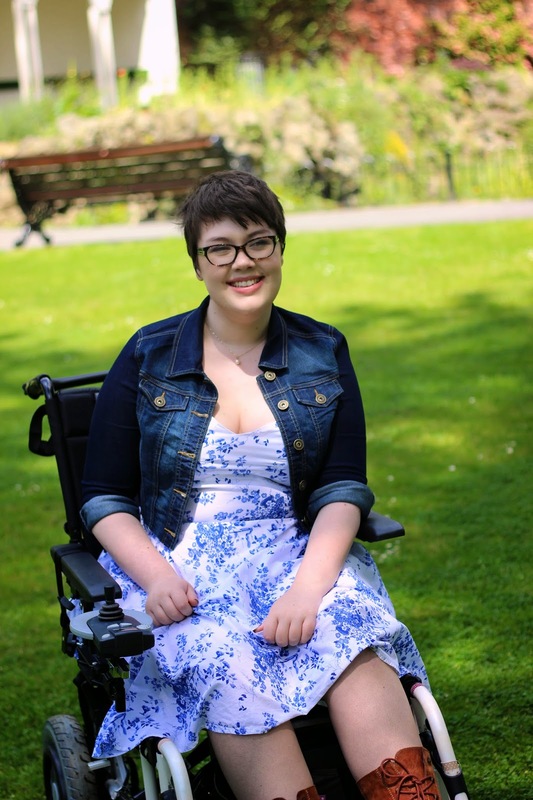 As a wheelchair user you get used to being seen as less - less of a person, less of a woman, of less societal & social value - and you kind of get used to it, you really do. You understand that anything you achieve is only valuable 'in spite' of your disability & that everyone sees you 'despite' the wheelchair, you know? "It's amazing that you stay so confident with all you are going through." "You look incredible, despite the...*wheelchair*." "I'm always so impressed that you are so happy & cheerful, I would just give up if I was in your shoes. What would I possibly have to live for?" On & on & on. And you hear it from everywhere, people who think they're trying to be nice think you are an inspiration & people who think they are being honest think that they'd rather die than be in your position. As a society we are conditioned into believing that illness & disability make people less & that becoming disabled is life destroying but honestly the only thing that makes us less as people is the way that society pushes that belief onto us. It is significantly harder for a disabled or chronically ill person to find work even when they are more qualified than any other applicant. Society at large believes that people with disabilities have horrible lives but studies are repeatedly showing that our quality of life is (in general) as good or even better than non-disabled people. And wheelchair users & people with other disabilities are non-sexual as a matter of course, being almost object like communal property like a cute dog or a pregnant lady. The fact that there are people so ignorant & offensive that they think it is okay to tweet 'funny' things that nobody should even think! An amazing response to a truly stupid tweet. I can think of so many things 'sadder' that a 'hot' (what a belittling word)person in a wheelchair. You look lovely in all your photos, sad only because I wish I could look as good! I was pointed towards this post by an enraged friend. Yet another hottie in a wheelchair. It's a fab post. Shame how it came about though. There's nothing sadder than educated people being pig ignorant. I'm currently writing a post on disability and fashion as I'm working with Models of Diversity's pressure group. I'll be sure to link this post.